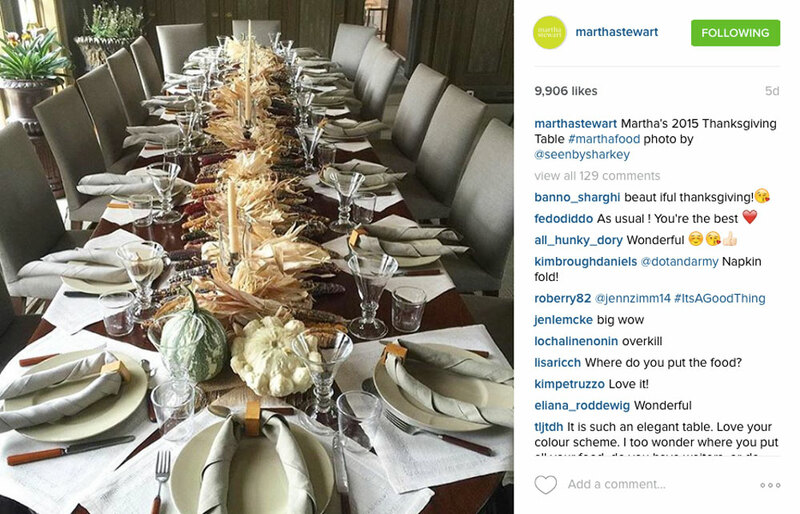 The Wednesday before Thanksgiving, Martha Stewart posted the following on her Instagram account. 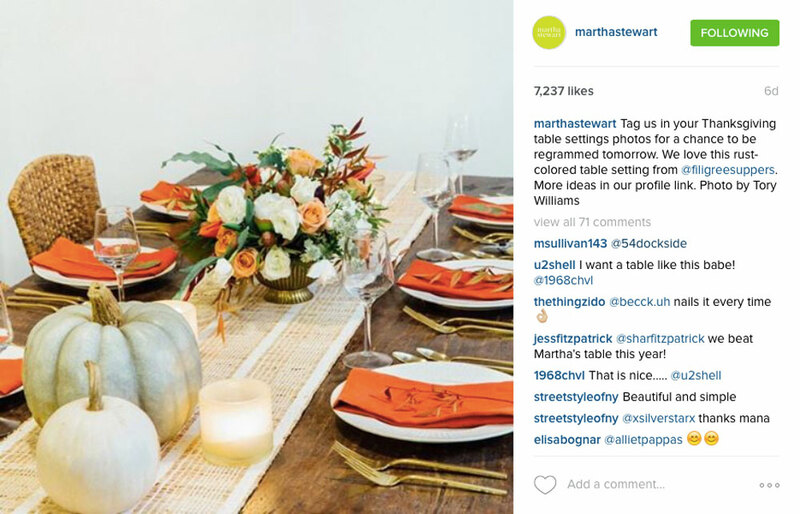 Her post promised to regram a table setting that she considered worthy of her Instagram account. Can you imagine how awesome it would be to have one of your pictures regrammed on Martha Stewart’s Instagram account? It means having your work exposed to millions (or 796 thousand) people that actually care, having the queen of the DIY world give you recognition, AND feeling really proud of your accomplishment! So, after I read this post, I had a meltdown of excitement and then decided to try and win the darn thing. I mean, why not? There is nothing to lose aside from hours of life and effort. So, on Thursday morning, I asked my friends for help and, 2 hours and 200 shots later, I posted this. Not bad, don’t you think? I hoped I had a decent chance at winning this thing. Well, a week has gone by and I am pissed at Martha Stewart because, not only she did not choose mine, but she didn’t choose anyone’s!!!!! Zero-None-Nil-Nada. Can you believe it? Are you even allowed to promote a competition and then flagrantly forget about it? What upsets me the most is the amount of hours I lost working on this picture. I wouldn’t have minded if I had lost, obviously, but I do mind that nobody even bothered to look at the pictures that so many of us posted. It upsets me that I spent 2 hours of my Thanksgiving day trying to get the perfect shot, and it upsets me that I recruited my two friends for nothing. So, there you go. I am pissed at Martha Stewart. Also, instead of posting a picture of somebody else’s table, she posted a picture of her own table setting, which made me even more upset because the darn thing looks a million times better than mine. Cuek! Am I over-reacting or is this a real reason to be upset? Well, I am sure Martha won’t care, because I will be back in love with her by tomorrow morning. For what it’s worth your table looks GORGEOUS. Even if Martha didn’t recognize. But, you know that everybody wants Martha’s approval… ha! did you end up decorating your table? This is 100% a real reason to be upset. And no. Hers doesn’t look as good as yours (in my honest opinion, at least). Hers looks pretty washed out – no colour on Thanksgiving? Not at all my thing. 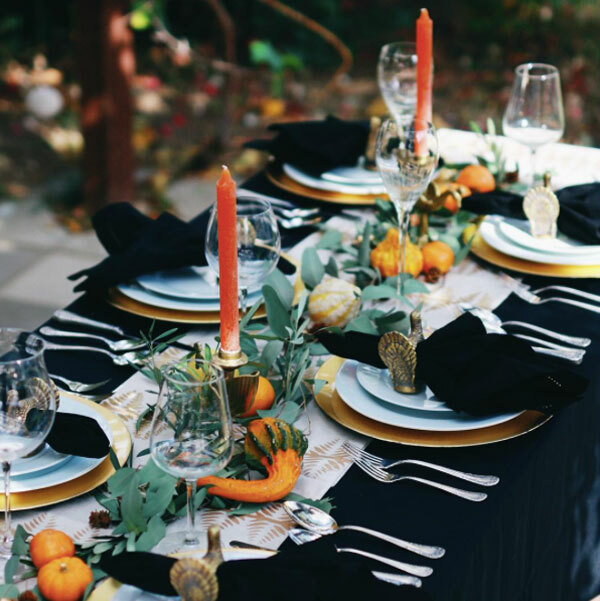 Your table setting looks absolutely amazing! What a bummer that no one was chosen.